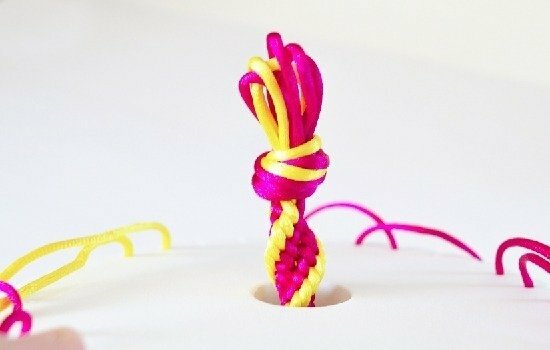 So last week I shared with you the most basic Kumihimo cord, the 8 strand. It’s easy, easy and a great into into Kumihimo. It was so easy, that for some reason I worried that other patterns would be really difficult. I probably made 20 different 8 strand cords before I had teh confidence to move on to a new pattern. And as it turns out, the 12 strand spiral is just as easy. I knocked 3 out my first night because they’re just that easy. Plus, it’s a lot of fun to see how your different color combinations will look. For the spiral you will need 4 cuttings of your interior color and 2 cuttings of your outer color. I used pink inside and yellow outside. Cut your interior colors (pink) about a 39 inches long. Cut your exterior color about 45 inches long. Gather the ends of the cords and find the center. Take and make a firm knot. Place the knot through the disk from the front. And lace the disk as seen in the image above… Your interior color, which you have 8 total strands of will go on either side of the tabs marked 2, 14, 18 and 30. Your exterior colors on either side of the tabs 8 and 24 (the ones marked with dots). We’re going to divide the disk into two halves, the left and right. On the left half take the bottom left cord and place it to the left of the top left cord. Take the top right cord and place it to the right of the only cord on the bottom left. On the right half, take the cord on the bottom left and place it to the left of the top left cord. Take the top right cord and place it to the right of the only cord on the bottom right. Take the bottom left cord and place it to the left of the top left cord. Take the top right cord and place it to the right of the only cord left on the bottom. Turn the disk and continue the same pattern over and over. As you work the disk your cord will begin to come out of the backside. When you get the length you need, grab all of the cords and pinch so that it doesn’t start coming undone on you. Carefully remove it from the disk. 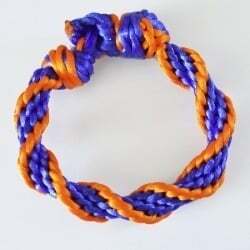 You can wear by tying the ends through the knot, much like on an every day friendship bracelet. 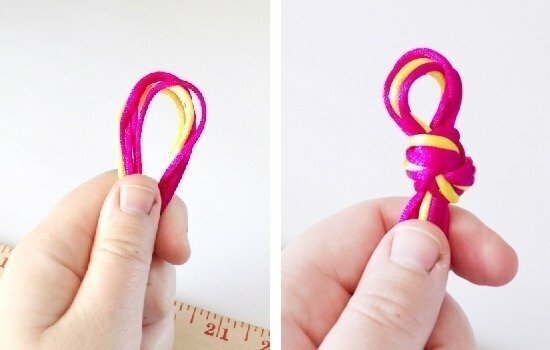 But I often have a hard time doing that by myself so I knotted up in that very way, and then glued the knot in place. I made sure to squeeze glue inside and all around the knot. Be sure your glue dries clear. I used Aileene’s Tacky Glue. 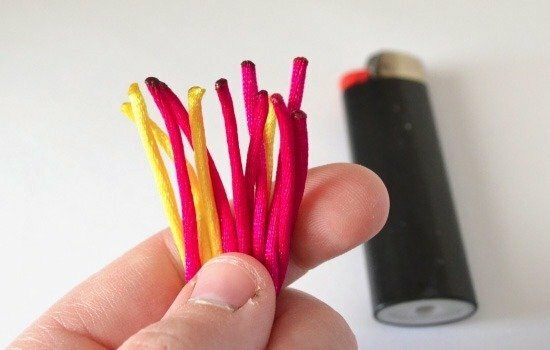 Take your raw ends and hit them with the flame from a lighter. 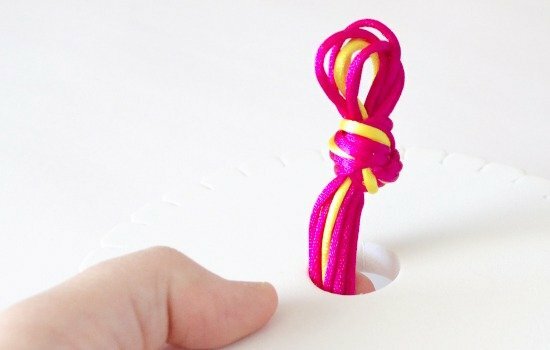 It only takes a second, but this will seal the ends so that you don’t get unravelling. Be sure that your cord isn’t flammable. I’m using satin rattail. Since I glued my knot into place, I wear mine like a bangle and just slip in on my wrist. The color combinations you can play with are so fun, too! I'm brand new to the Kumihimo game but I'm absolutely addicted! Definitely going to give this a shot! This is so cool! I was interested in kumihimo when I was younger but I totally forgot about how much fun it is!! thanks for sharing! 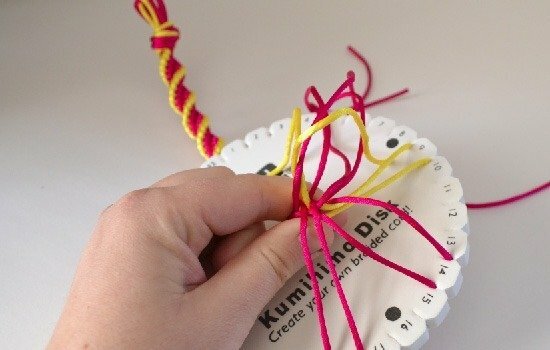 I have a Kumihimo disk but have yet to try it! You'll love it, Vanessa – I promise!! Hey, Mackenzie! Glad you're going to come back to kumihimo! Thanks for sharing your tutorial. I've made an 8 strand before but never a 12. You're so welcome, June. It's a really fun braid! What a great DIY! The turning, and where you put the cords you move are where I have gotten confused. Your tutorial showing the turning are genius! I haven't tried the 12 strand and this makes me want to give it a try. Thank you! I ordered a set for me and my 8 year old grand daughter. She caught on quickly to the 8 string pattern… Great fun for both of us!! Thanks! Thank you for sharing a 12 strand kumihimo braid. 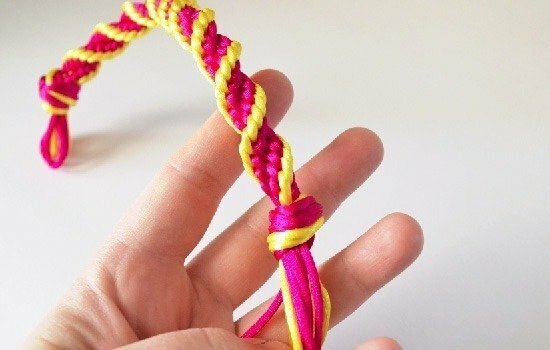 I regularly do an 8 strand braid and was looking for someone to show me a 12 strand braid. You are so welcome! I stuck with the 8 strand for a while, but the spiral 12 strand is one of my very favorites, now! Have you tried adding beads to a 12 strand? I am curious how it would look, I might just try it…. I’ve mostly concentrated on the 8 strand but I’ve started trying to make some patterns with the 12. I think that it would be just like the 8 just a bit thicker… Will definitely give it a go! You could put a big button on the end and button through the loop if you wanted. Very pretty work. I’m just learning myself. Thanks so much! A button is a genius idea – I’ll be trying that out soon! Just be sue to click the Kumihimo button because they both support other crafts. Lots of photos, patterns, design tools, etc. I wish this was printable but I love it! I can’t wait to try it! Great tutorial! At first, the moving arrows confused me but when I slowed down and watched closely, I understood the placement of the strands and it helped tremendously! 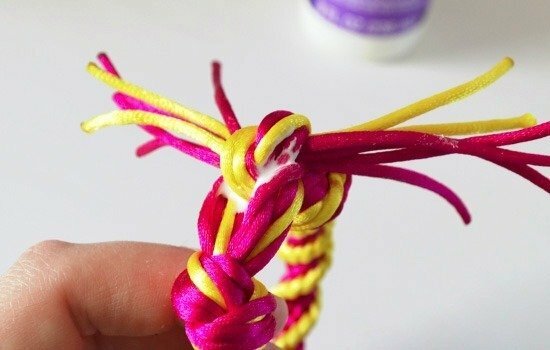 I love how this braid spirals and I’m so excited to try it with beads! is it possible to have 3 interior colours and one exterior instead? hwo would you string this? Absolutely! Show me the results if you try this? I’d love to see how it turns out! Where do I get the kumihimo disc? Or do you have a pattern to make the disc? 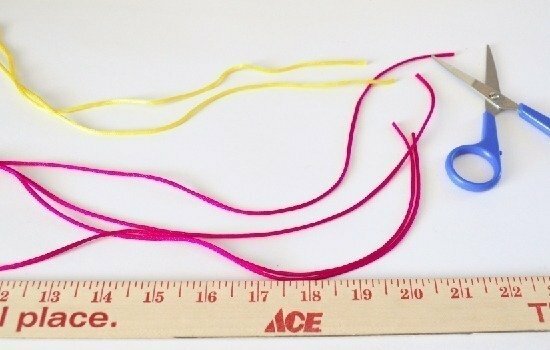 You can purchase them online, in craft/jewelry making stores or even at Walmart in the jewelry making section. It’s so much fun to find new things to try. This is where happiness is found. So…I am a ‘great craft idea but never seem to get them done’ addict. 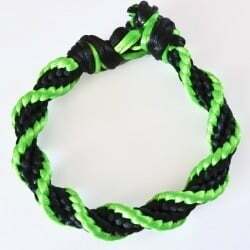 I had picked up some rattail cord because I knew my daughter would like the colors and figured I could try doing some hemp knot type styles with it. 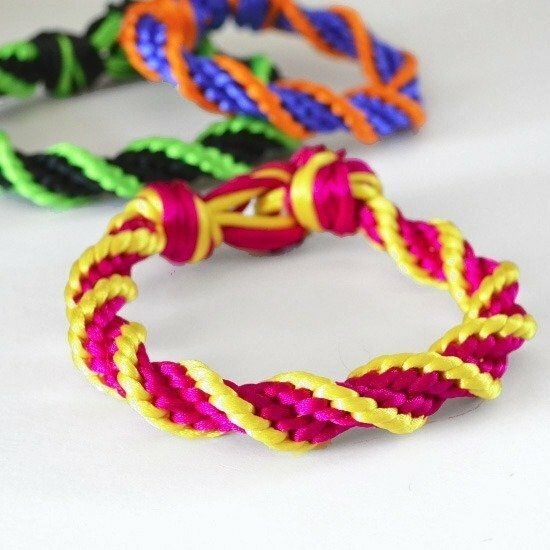 I have a different bracelet plan going for her and was looking for a new braid style when I came across your instructions here. Let’s just say that your instructions and enthusiasm had me looking to see where I could get a disk NOW. I went to the craft store and luckily they had a kit (can’t even tell you if they have cord in it) and can not WAIT to get started! I may be a total failure at it (we’ll see in a few hours), but I want to thank you for such a ‘fun’ post (I read your 8 strand one too) that I think I might actually get something accomplished this time around! I’m wanting to do the spiral technique with beads. Is it set up the same way? Yes, it is the same, but I must say it’s a pain in the neck :) I started one but my beads were not all the same (cheap beads) so try Toho or another that are really uniform. 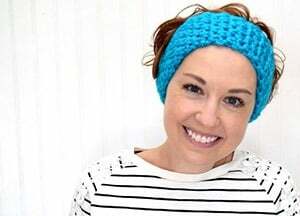 It will save you from pulling your hair out :) I might give it another go with better beads! Share if you think of it when yours is through!